Director/Screenplay – Don Coscarelli, Based on the Novel by David Wong [Jason Pargin], Producers – Brad Baruh, Don Coscarelli, Aaron Godfred, Josh Lewin, Andy Meyers & Roman Perez, Photography – Mike Gioulakis, Music – Brian Taylor, Visual Effects Supervisor – Aaron Godfred, Visual Effects – Generation FX (Supervisor – Gene Warren III), Makeup Effects – Robert Kurztman’s Creature Corps (Supervisor – Robert Kurtzman), Additional Makeup Effects – Almost Human Inc (Supervisor – Rod Hall), Production Design – Todd Jeffrey. Production Company – Silver Sphere Films/M3 Alliance/Touchy Feely Films. David Wong sits down in a diner to tell writer Arnie Blondestone the incredible story of his life. He and his best friend John gained a reputation as investigators of the paranormal. John died under mysterious circumstances but then began to reappear both alive and dead, while David received phone calls from him in the future and from the afterlife. The trail of events led David to a drug known as Soy Sauce that gave him incredible knowledge and the ability to travel beyond space and time. The two of them passed through a series of bizarre incidents where they had to deal with body snatching beings from other dimensions and into an alternate timeline to combat the demon Korrok, a vast artificial intelligence. Don Coscarelli is a genre director with a cult name. Coscarelli had a reasonable hit with his third film Phantasm/The Never Dead (1979), one of the first films to venture onto the subject of dream and reality with its trippily mind-spinning plot about alien grave robbers, head-drilling silver spheres and dwarves from other dimensions. For the next two decades however, Coscarelli failed to fulfil the promise of Phantasm. He made one mainstream venture with the sword-and-sorcery film The Beastmaster (1982), which to all accounts was not a happy experience for him, and one other film with the forgotten Backwoods Brutality effort Survival Quest (1988). Outside of that, Coscarelli spent his time returning to the familiar and playing to his fanbase by generating Phantasm sequels with Phantasm II (1988), Phantasm III (1994), Phantasm: OblIVion (1998) and Phantasm: Ravager (2016). Coscarelli seemed to find renewed vigour with Bubba Ho-Tep (2002), which gained a cult following with its hilarious premise about an aging Elvis Presley in a retirement home fighting against a mummy. This seemed to show new directions for Coscarelli away from making Phantasm sequels and into a comically surreal genre territory. A promised Bubba Ho-Tep sequel, Bubba Nosferatu: Curse of the She-Vampire, has remained in limbo for most of the 00s but Coscarelli returns to similar territory here. Coscarelli bases John Dies at the End on a novel by David Wong (the same name as the hero of the story). Like the film’s shifting perceptions of reality, John Dies at the End is anything except a regular novel. The creation of Jason Pargin, who subsequently became the editor of Cracked.com, it started out as an annual Halloween story that Pargin would publish on his previous website Pointlesswasteoftime.com. Pargin subsequently edited the stories together and published them in book form as John Dies at the End (2007), where he took the pseudonym of David Wong. Wong/Pargin subsequently released two other John Dies at the End novels with This Book is Full of Spiders: Seriously, Dude, Don’t Touch It (2012) and What the Hell Did I Just Read (2017). Don Coscarelli became a fan of the book and obtained the rights, producing this film version that debuted at the 2012 Sundance Festival. 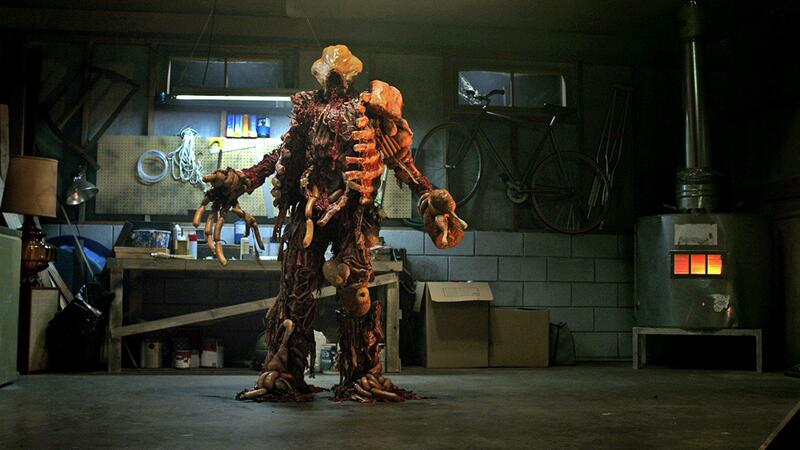 This begins the film’s run of bizarre stories – Williamson is in called by best friend Rob Mayes to help a girl who claims her boyfriend has become a zombie, only for them to become aware that she is not what she appears to be and is actually a tentacular demon. In the cellar, they encounter an entity that has returned to life by transforming all of the meat in the deep freeze into a body, including taking a frozen chicken as its head. It wants to settle scores with celebrity psychic Clancy Brown, whereupon Williamson calls Brown up on the cellphone, hands the phone over to the meat monster where Brown mutters an incantation down the other end that causes it to collapse. The film’s plot is a giant shaggy dog story. It is episodic – but then so was the original novel (even if Don Coscarelli’s adaptation curtails some of the stories). There is an encounter with a Jamaican drug dealer named Robert Marley who provides the Soy Sauce that informs much of the plot, something that allows the user to gain incredible knowledge, even transport beyond the realms of the here and now, including at one point letting Chase Williamson travel back in time and affect the manufacturing of the bullet that is about to be fired at him so that it falls harmlessly. There is a mind-spinning scene where David is taken to a police station, John calls up, telling him to just walk out, David protests that a cop is watching him and John asks him to be sure whereupon David realises that there is no cop when he looks in the mirror, the cop being then attacks him and its mustache tears itself off and flies around the room like a butterfly, trying to attach itself to David. At other points, Williamson has conversations with John (who though he may not die at the end is variously dead and alive throughout the film) who, in a gag borrowed from Lost Highway (1997), at one point calls David up on the phone from the future as the other John stands opposite him. There are casually tossed off lines of dialogue like where David receives calls from the undead John who wants to know when he is calling: “Oh wait, we must be going to the mall because Fred’s still alive.” Upon realising that his cellphone is broken and that John’s voice advising him on things about to happen is in his head, David continues on having a conversation using a bratwurst sandwich as a telephone. In one of the most hilarious gags, the dog suddenly develops the ability to talk and becomes the cavalry that saves the day by driving the car to the rescue. Later the heroes are co-opted into entering an alternate world to fight off the demon Korrok and learn a potted account of the world’s historical divergence, which involved genetic experiments and the creation of animal-human hybrids, wherein we get sepia toned film footage of the Wright Brothers taking to the air with a plane that is a hybrid flying pig. Your head stretches trying to pigeonhole John Dies at the End. The film seem to fall somewhere between the reality-bending of Donnie Darko (2001) and a slacker version of a supernatural investigators show like Supernatural (2005– ) crossed with the trippy esotericism of Marvel Comics’ Dr Strange. 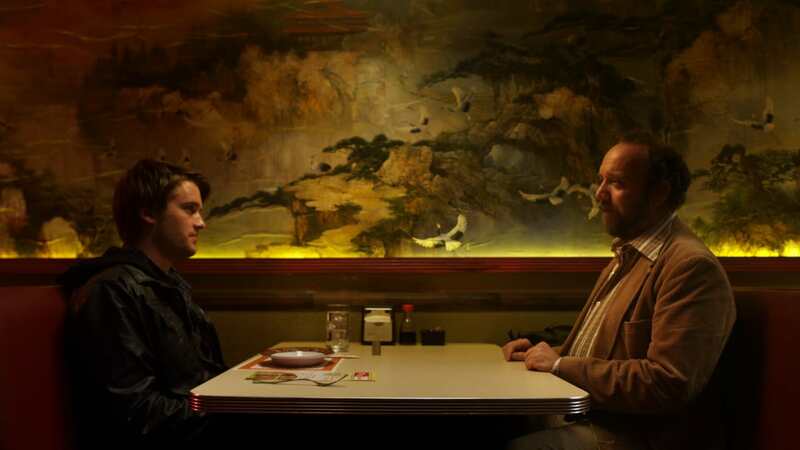 When the film introduces the Soy Sauce and all manner of mind-expanding mental powers and abilities of perception, you feel like it has become a stoner version of Limitless (2011) – if maybe Limitless had been the druggie film that it seemed too caught up in its pretensions to be. You could also compare John Dies at the End to any number of stoner comedies – it suggests maybe a Harold and Kumar Go H.P. Lovecraft, or perhaps something akin to the surreal happenings of Dude, Where’s My Car? (2000), even if both of those exist at opposite poles of the spectrum in terms of the sophistication of their wit. Maybe a stoner comedy that had suddenly gotten tangled up in some of William S. Burroughs’ more trippily paranoid novels like The Soft Machine (1961), Nova Express (1965) and The Ticket That Exploded (1967). John Dies at the End is a completely mad film – and all the funnier for it. Its tone is that of a constant mellow hash haze where the zaniest mind-expanding concepts are delivered with nonchalant cool. Don Coscarelli has condensed David Wong’s novel to a trippily amusing series of shaggy dog incidents that turn with sublime wit. It is the mind-expanding wackiness of the plot where Don Coscarelli is having a ball screwing with what we think we are seeing or throwing in things that have an amusing habit of travelling off on a long curve ball and coming back to hit you when you least expect that makes the film. The result is surely the best mind-expanding fun it is possible to have without the use of illegal substances. (Winner in this site’s Top 10 Films of 2012 list. Nominee for Best Adapted Screenplay at this site’s Best of 2012 Awards).